At our house we aren’t just approaching the end of summer; we’re approaching the end of an era. An era of boys and dogs, of tickle fights and popcorn crumbs, of Saturday morning snuggles and late night snacks. We’re approaching change, growth, the beginning of a new era. While I know that change is inevitable, and that the new can be as good as or better than the old, I also know that change can happen in the blink of an eye. And that change can be permanent and it’s not always good, because we never know when we might face loss. This time of year reminds me of that, since some of the most painful losses of my life have occurred at the end of past summers. So I try to cherish even the things others might find annoying. After all, we never know when something that we have taken for granted, might be our last. Our last hug, our last tickle fight, our last little boy giggle before he becomes a man. This summer, I have allowed my grandson’s to share my bedroom with me. The older has crashed on a small fold out love seat and the younger has slept with me – along with their 120 pound American Bully and their 15 pound poodle. It’s made for a crowded room and a crowded bed, but I wouldn’t change any of it. They won’t be boys forever, they won’t want to watch cartoons and have tickle fights for much longer, and they certainly won’t want to sleep in Grammy’s room for much longer. So, I’ve learned to sleep in odd positions, and to wear a night mask to block the light from the muted television (they don’t like a dark room). And I’ve learned to tolerate boy ‘funk’ and stinky socks; to remember to check to see if the toilet seat is down before using the potty in the middle of the night. I’ve gotten used to making and remaking the bed after each tickle fight, used to arms and hands dangling in my face as I sleep, to fighting for covers, and tolerating the dog’s whimpers while they’re dreaming. I overlook the empty drink containers, and the snack crumbs on my floor, I overlook the assorted games and boy treasures they leave on my dresser. The half hour showers and the wet towels left on the bathroom floor. Why? Well, because if there’s one thing my age has taught me is that this time is very fleeting, soon they’ll be men and Grammy will be just a sweet old woman they’ve left behind. And because they are two of the sweetest young men ever, with good hearts and good manners, because they love me and enjoy spending time with me, because at this point in their lives I’m still important, still someone they’re happy to see come home from work each day, still someone to share a sunrise or a day at the beach with, and that makes me feel very special. And because yesterday when I came home from work, they had cleaned ‘our room’ and they couldn’t wait to show me. The beds were made, the floors were swept and mopped, the dresser was dusted and the night stands were clean. Two super guys like that deserve to hang out in Grammy’s room any time they want. So yes, the end of summer makes me sad. I don’t do endings well. I’ve experienced so much permanent change in life already. I know that we often daily take for granted the little things we should be so thankful for. We truly have so much to cherish. Because one day, all too soon, I’ll be the proud grandmother of two grown men and will have a clean, crumb free bed, all to myself. 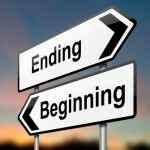 What era are you ending and what new things are you beginning? Happy Friday. Editor’s Note: Thanks to Sharon for guest posting today.